Hit the road in style by wearing our wide range of jeggings. The stretchy nature of our jeggings sculpts the shape to accentuate feminine characters and brings movement to one’s gesture. What made it best for wearing is that it is perfect hybrid of skinny jean and a legging, a jegging is a stylish and comfortable alternative that combines the key benefits of each style: the curve hugging and stylish look of skinny jeans and the comfort and elasticity of leggings.What more we can wish for. A true dual benefit piece of clothing that you can own. What sets jeggings apart from ordinary skinny jeans is their incredible comfort. They will fit just like leggings and they won’t feel uncomfortable on your legs or stomach when you sit down or cross your legs.Say bye bye to no breathe stomach disability.Hahaha. Our jeggings features elasticized waistband that ensure comfort and radiate a new age style. 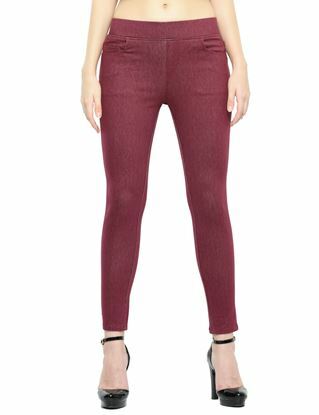 A combination of coziness and panache, our pair of jeggings is perfect for you at work. You can wear it quite conveniently as it comes with a stretchy fabric. Besides, it will keep you at ease all through the day owing to the use of a superior quality fabric, which went into its making. 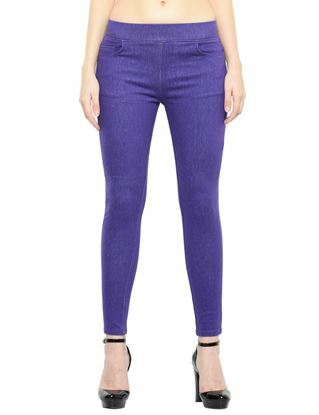 Designed with care, these pair of jeggings will be a perfect choice for all the fashion conscious women of today. These pair of jeggings with a wide variety of styling used in each style gives the right fashion punch. Our stylish pair of jeggings is comfortably chic to be paired with all your tops to complete the ensemble. Stay ahead in the fashion game by slipping into our ultra chic pair of jeggings. Jeggings can be styled in countless different ways. You can wear them with a loose tunic, form fitting blouse or even a crop top. Pair them with heels or high-heel booties for a night out, or dress them down with sneakers or flats for a casual lunch date. Because they are formfitting and straight leg, jeggings look great when tucked into boots and high-top sneakers. Their stretchiness makes them fit your body better than traditional skinny jeans. Also, because they are straight leg and formfitting, they elongate your legs and make you look longer and leaner. Pair them with a pointed-toe heel to enhance the look. They make “fat jeans” obsolete. Seriously, Gain 5 pounds. Gain 20 pounds. Whatever your jegging will still fit. Jeggings can be dressed up or down with a myriad of looks and accessories. Whether running errands around town, finishing the week with a casual friday at the office, or dressing up for a night out, jeggings are a stylish staple in a woman’s wardrobe. The huge range we offer in our jeggings is our USP. You will surely get a set of choices to choose from –variety of colors, a number of designs and yes all possible sizes.Bring home these pair of jeggings that can lead you high on scores over the style metre.